Track in real time with the ultimate all‑tube vocal processor. Featuring UA’s groundbreaking Unison™ technology, the Manley VOXBOX Channel Strip plug-in for Apollo and UAD-2 hardware is a stunningly faithful emulation of this premium vocal channel strip. One listen and you’ll hear why it’s the vocal choice of Beck, Rick Rubin, U2 and more. Learn how to use this incredible channel strip on vocals, bass and drums. Introduced in 1997, the Manley VOXBOX combines the best of Manley’s audio designs, including their high-fidelity tube mic preamp, vactrol optical compressor, Pultec-style passive EQ, and de-esser/limiter into a formidable 3U package. Featuring Manley’s legendary boutique build quality, including in-house wound transformers, the VOXBOX stands alone as a premium tube-driven toolbox for outstanding vocal tracks. Chock full of Class A vacuum tube tone, the Manley VOXBOX Channel Strip plug-in expertly emulates the hardware’s rich, feedback-style mic preamp. Harnessing UA’s groundbreaking Unison technology, the VOXBOX plug-in perfectly captures the impedance, gain staging, and the circuit behaviors that have made the hardware famous. The secret is Unison’s bi-directional control and communication — from the plug-in to the digitally controlled mic preamps in Apollo audio interfaces. 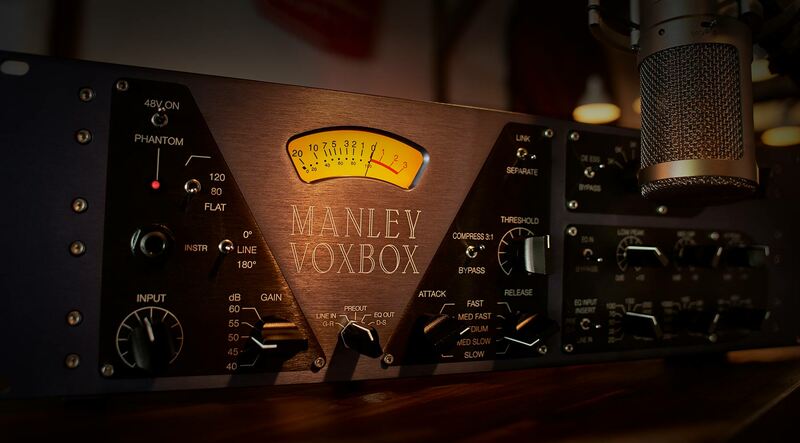 Just like the hardware, the Manley VOXBOX plug-in lets you tame transients before the preamp with its flexible optical compressor. This innovative topology, as well as the compressor’s 25 interactive Attack and Release combinations, assure exceptionally clean, smooth-sounding tracks. The Manley VOXBOX Channel Strip plug-in’s three-band, passive EQ is based on the classic Pultec MEQ-5. With two peak bands, one dip band, and greatly expanded and overlapping frequency selections, this broad-stroke EQ keeps the top end sweet, and the lows defined, yet natural sounding — even with extreme boosts and cuts. At the center of the Manley VOXBOX is its sublime, natural sounding de-esser. With two knobs, you’re afforded complete control of not only vocals, but shrill electric guitars, or overly bright overheads. You can also turn off the de-esser frequency control and use this section as an aggressive and colorful limiter. For years, the Manley VOXBOX has been a secret weapon for bassists looking to harness its high-end tube signal path and slick EQ and compression appointments. Engineers have also called on the Manley VOXBOX for clean electric guitars, strings, and drums as it’s always-musical results can elevate any source way beyond the ordinary. The Manley VOXBOX plug-in is as wonderful as many fans testify to the original hardware... great sounding emulation! Great, a unison channel strip with built-in de-esser, I've been thinking this was wanting. However, I find the de-esser is not very effective. In fact, I may not be a hardware engineer, but isn't placing the EQ before the de-esser poor thinking? I'm not about to boost the high end and enhance the esses going into the de-esser. I'm probably naive, but it just doesn't seem right. This plugin doesn't solve my esses, I still have to use an insert for that purpose. Still waiting for the unison channel strip with de-essing. Respect the other companies but the UAD plugins are different, I'm getting closer to the jobs of the mixer engineers that I follow, I'm selling my beats not because I'm famous but they are recognizing the quality in my tracks! !